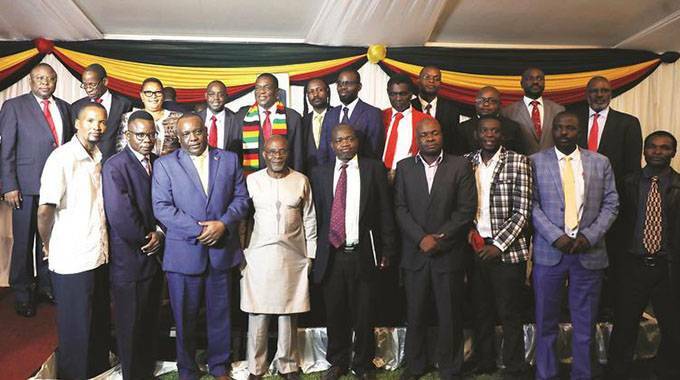 Political parties that fielded presidential candidates in the July 30, 2018 harmonised elections yesterday met at State House in Harare and committed themselves to the principle of dialogue and working together to resolve challenges facing the country. Out of 23 parties that fielded presidential candidates in the internationally-observed harmonised elections, 21 were represented. Only MDC-Alliance — led by Mr Nelson Chamisa — and the Republican Party from Bulawayo failed to show up, confirming that Zimbabwe as a nation was ready to engage itself to solve a myriad problems it is facing. And yesterday, the President described the occasion as historic as it affirmed political maturity among Zimbabweans. The parties agreed that there should be no precondition for dialogue and that there should be no sacred issues during the discussions. Further, it was agreed that both political and economic reforms should be implemented while politically-motivated violence should be shunned. Four committees were set up, with the first one focusing on the institutional framework of the dialogue, while the second would deal with the agenda items for the dialogue. The third committee was going to determine the convenor of the dialogue, while the fourth one would be responsible for monitoring and evaluating the implementation of the agreed issues. Welcoming participants, President Mnangagwa said Zimbabweans had the right to chart their destiny with outsiders only coming in to assist. After the meeting, which lasted several hours, President Mnangagwa said: “I think this interaction or consultation between the leaders of the political parties which participated in the 2018 harmonised elections was overdue. I am sure you listened as I explained at the beginning the consummation of this meeting. However I am happy that we have been able to come together as Zimbabwean political parties to discuss issues affecting our country in particular in the area of the economy, reforms, political and economic reforms and various views on how political party leaders think we should move forward. I am happy that we have come to the conclusion that we need to further come together and interrogate how as a people, as a country can move forward in unity and in peace. Many negative issues have been raised which the political parties would want addressed. I am happy that there was democratic space for every single leader of political parties that have attended to express themselves openly and freely. This is what it should be. I believe that with this beginning we should as we go forward find each other and chart a common course for our country to move together. Chairperson of the National Peace and Reconciliation Commission Justice Selo Nare moderated yesterday’s meeting.